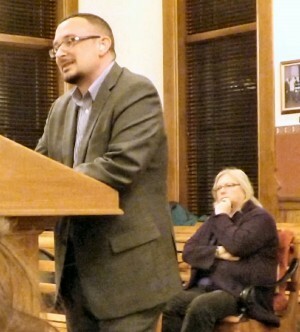 Justin Rudgick, community development director, makes a point at Monday's committee meeting. Seated in the background is Mercedes Niess, director of the Marine Museum. OSWEGO, NY – At its meeting Monday night, the Administrative Services Committee recommended earmarking funds now to complete a granted project begun years ago. The project was started back in 2006, Justin Rudgick, community development director, told the committee. Justin Rudgick, community development director, makes a point at Monday’s committee meeting. Seated in the background is Mercedes Niess, director of the Marine Museum. The city had applied for a grant from the Canal Corporation with the intention of restoring an existing facility, located along the canal near the lock, into a visitor welcoming center. The director said he recently discovered this is still an open grant. Unless the city completes the project as originally intended, the Canal Corp. won’t honor the initial allocation of $75,000. For the city to complete the project it would cost an estimated $80,000, the director noted, adding the city has until the end of the year to do the work. However, he said he has been in contact with the Canal Corp. and they are willing to extend the deadline into 2016, provided the city commits to the work. This year alone there were 800 season passes purchased at Lock 8 alone, he said. In one season, he added, there were 12,000 boats that went through the Oswego Canal system. The Port City could capitalize on that traffic, he said. “Whatever we spend, we’re going to get back,” Councilor Fran Enwright said. Councilor Ron Kaplewicz agreed, saying the city should commit now and formulate a game plan for getting the rest of the project completed in the spring. Mercedes Niess, executive director of the Marine Museum, said there is great potential for this facility. “It is situated in a perfect spot,” she said, pointing out that visitors have access to various major roadways; those who have stopped there have visited the library, the city’s museums and businesses. “We’re developing ways to entice visitors, not just passing through but stopping and staying in Oswego for a few days. The guys at the locks do their best to be ambassadors for the city. But they close up at 6,” she said. Finishing the project is important, according to the community development director. “If we don’t move forward with the project, then I am concerned that it would be a black mark for the city of Oswego,” he said. That the city didn’t complete the project may have consequences on how future grant applications by the city are considered, he pointed out. The committee forwarded a resolution to the full council recommending the funding to complete the project in 2016. Caroline Anderson, animal control officer, requested permission to accept a donation of $803 from the Merriam Barrett Guest House and the “Witches of Falloween.” The money is donated from proceeds of a gift basket raffle (created by the Darling Elves Flower Shop and donated by the Merriam Barret Guest House. Barbara Sugar, city clerk, requested permission to transfer funds in the amount of $3,500 from the City Clerk’s Miscellaneous Expense Account No. 1410.460 into the City Clerk’s Contracted Services Account No. 1410.440, to pay for the cost of amendments to the City of Oswego Code Book. The Engineer’s Office requested the mayor be authorized to amend the contract of Sewer Specialty Services Co. Inc. to include Change Order Nos. 1 and 2, regarding Sewer Investigations Area 2, EFC Project No. C7-6344-19-04. Change Order No. 1 is for $0 and Change Order No. 2 decreases the contract in the amount of $34,522.84. The Engineer’s Office also requested a transfer of $3,000 from Account No. G.8140.0460 (Miscellaneous) into Account No. G.8140.0440 (Contracted Services), for insufficient funds to cover sludge disposal, $1,250 from Account No. G.8140.0480 (Clothing & Boots) into Account No. G.8140.0440 (Contracted Services), for insufficient funds to cover sludge disposal at the Westside Wastewater Treatment Plant, and $2,000 from Account No. G.8130.0460 (Miscellaneous) into Account No. G8130.0440 (Contracted Services), for insufficient funds to cover sludge disposal at the Eastside Wastewater Treatment Plant. Deborah Coad, city chamberlain, requested authorization to complete all necessary paperwork to comply with the mandated rules and regulation regarding the Affordable Care Act Compliance and Health Care Providers and Services. She also requested permission to complete the necessary accounting procedures to bring all ledgers into balance for the purpose of closing the city’s 2015 financial records. The committee sent all the requests to the full council for consideration of Nov. 23. We had a wonderful opportunity in 2000 to develop our Canal Corridor with substantial funding from NYS. Sadly, that money was diverted to NYC due to 9/11 and upstate lost an opportunity, understandably. Now we have a chance in small ways to grab and hold onto the future endeavors for improvement to upstate NY, and we must accept that like many other regions, TOURISM is the answer. With four season and two waterways, we are perfectly situated for development. I am SO happy to see that Mr. Rudgick and Ms. Niess understand the importance of this to Oswego!